Update 12-09-2012 The red body version of this stocking SOLD OUT. These stockings are specially made Dupion which it is a signature checkered look that is created by an irregular thread reeled from two or more types of fabric. It makes for a beautiful design The listing is for ONE stocking, we pictured the two matching designs together so you can see what the set looks like. 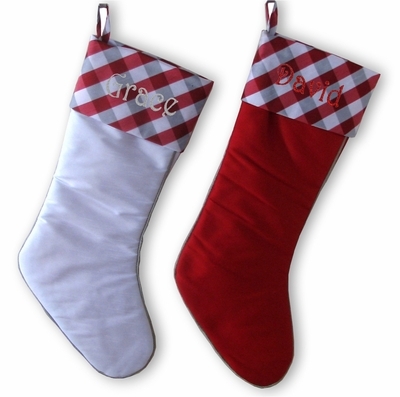 Available in two designs - RED stocking and WHITE stocking. Silver Piping on the stocking edge, modern taffeta fabric. We monogram / embroider these stockings with smaller version of our personalizing fonts to fit into overall design of the stockings. Measured This stocking measures 20" long along the diagonal from the top of the cuff to the toe; and the width across the cuff is 6 and 1/2". Materials: Taffeta polyester blend fabrics. Lining: YES. This stocking is beautifully lined inside.